The drama "Suitengû Megumi no Fukagawa" was premiered in February 1885 at the Chitoseza [casting]. Funazu Kôbê, nicknamed Fudeya Kôbê, is a poor peddler selling writing brushes in the district of Fukagawa, near the Jôshinji Temple. He used to be a samurai but the fall of the Tokugawa Shogunate and the collapse of the class system deprived him of his means of living. No more a samurai, he now lives in extreme poverty. Moreover, his wife had died and he has to care for his two daughters, Oyuki and Oshimo, the former being blind and the latter being a young baby. On the previous snowy night, while walking around town and trying to sell his brushes with Oshimo settled on his back, he passed the home of the fencing master Ogiwara Ryôsaku. Oshimo started to cry for her mother milk. 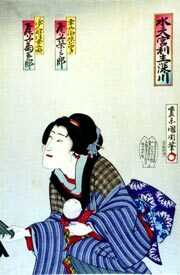 Ogiwara's wife Omura, who had just lost her own newborn child, felt pity and fed Oshimo from her breast. Kôbê also received money and clothing and went back home happy. 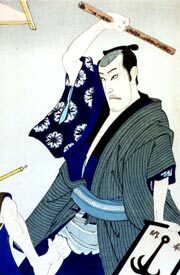 Later, Ogiwara Ryôsaku realized from a paper wrapping left behind by Kôbê that the brushes peddler was the son of his own former fencing teacher. The following day, Kôbê, who was deeply grateful for the kindness of the Ogiwara family, went at the Suitengû Shrine to offer a prayer of thanks. Kôbê is sure that the Gods are helping him. At home, Kôbê receives the visit of Kinbê, a merciless money-lender Kinbê and his accomplice Yasuzô, who are here to get their money back. They take advantage of Kôbê's gullibility and ask for outrageous interest rates for their loan. Kôbê cannot pay the amount and they take away by force Oyuki's own money and the Ogiwara's clothing given to Oshimo. The two evil men leave Kôbê's home. The old man is desperate and appeals to the sahainin Yohei for help. Kôbê tells his story to Yohei, who is angered at Kinbê's unscrupulousness. The sahainin tries to put Kôbê's mind at ease by promising he will do his best to bring everything back to Kôbê. The despairing Kôbê grieves at his family's piteous circumstances and Oyuki laments that her blindness prevents her from helping her father. Kôbê thinks of committing suicide but the fate of his children holds him back. Oyuki perfectly understands her father's dilemma and she suggests that they all die together. This is the only way to end their troubles. Meanwhile, from a neighboring house, Kôbê can hear some jôjûri musicians, who have been hired for a family celebration. comparing his own pitiful and impoverished condition with the celebration next door, he realizes there is a deep gulf between his life and the other life symbolized by the lively jôjûri music. All these frantic and desperate thoughts, coupled with the emotion of having to kill his own children, suddenly drive him crazy. 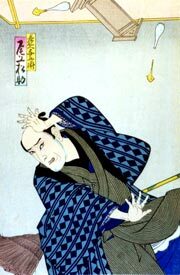 He takes a broom and using it in place of a sword, starts to perform a Nô dance about the ghost of a warrior. Neighbors run in and try to restrain him, but he tosses them aside. The jôjûri Yohei is back at Kôbê's home, bringing with him the baby's clothing. He shows it to Kôbê, hoping to please him, but Kôbê thrusts him aside too. The neighbors are rescued by the strong rickshaw Sangorô, who successfully grabs Kôbê. The desperate brush-seller comes to his senses again for a short period of time, looking with a lot of pity at his daughter, but his mind drifts again into craziness. Omura, the spouse of the fencing master Ogiwara, comes on her husband's orders to find Kôbê, who is now identified as the son of Ogiwara's former master. Unfortunately for her, Kôbê is in no condition to understand the situation. His craziness leads him to suspect that she has come to steal away Oshimo. He runs away from his home, carrying Oshimo in his arms and pursued by the neighbors. Kôbê hurriedly heads in the direction of the riverbank, in the purpose of drowning himself with his daughter. Kôbê has leaped into the river with Oshimo in his arms. They are quickly rescued by Sangorô. The brush-seller has experienced such a strong shock that he can return to his senses again. Oyuki, Yohei and all the other neighbors come running to the riverbank. They are relieved to hear that Sangorô had saved both Kôbê and Oshimo and that the poor brush-seller is no more a crazy man. Kôbê, Oshimo and Sangorô are dripping wet and they need to change their clothing as soon as possible. Omura and her suite arrive at the riverbank, bearing a big bundle full of clean and dry clothes. Recognizing Omura and remembering the previous night events, Kôbê thanks her for her kindness. She gives him some money as well. This is a happy ending thanks to the god of the Suitengû Shrine, who is keeping good watch over the family of Fudeya Kôbê. This summary would have not been possible without the help of Sekidobashi Sakura!